You are here: Home / Learning Centre / How Can You Optimize Resources and Processes? 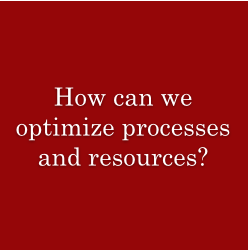 Resource optimization is the set of processes and methods to match the available resources (human, machinery, financial) with the needs of the organization in order to achieve established goals. Optimization consists in achieving desired results within a set timeframe and budget with minimum usage of the resources themselves. The need to optimize resources is particularly evident when the organization’s demands tend to saturate and/or exceed the resources currently available. When a company is managed with the Decalogue approach, then resource optimization is strictly linked to the concept of constraint and a systemic vision of the company. Indeed, without a systemic vision of the company we are unable to identify the global effectiveness of resource allocation and we run the risk of using resources available mainly to respond to emergencies that daily occur in the various parts of the organization. We see the structure of an organization as a network of projects which cut across company “functions”, in contrast with the hierarchical view of a company divided up into silos unable to recognize precise patterns and rules of interdependencies. When we manage a company as a network of projects we must be able to allocate the resources available in the most efficient way possible, always bearing in mind that we have to achieve the global goal. A project is itself a system: a network of elements (tasks) that are interconnected and interdependent, that work together to achieve a precise goal. The fact that the tasks are carried out by a pool of finite resources means that optimizing the sequence of tasks is a matter of considerable complexity. (cf. the well-known problem of P vs NP). A further level of complexity is due to the human factor connected with determining the length of individual tasks. It is well known that if we are asked by our boss how long it takes us to complete a certain task, we tend to protect ourselves by asking for considerably more time than is strictly necessary. This is made worse by multitasking (the tendency to do several things in parallel). While multitasking is very useful for computers it is decidedly counterproductive for the human mind. Finally, there is the effect of the so-called student syndrome, in other words whenever we have more time than we need to do something we will always put it off until the last minute. The situation becomes more complex when multiple projects have to be managed, and possibly by different people. When a resource becomes unavailable, let’s say they are ill, ways to take corrective actions must be available other than just delaying the related tasks. Although ultimately the decision is taken by the project manager, the Information System can provide useful information to support such decisions. The correct way to handle multi-projects is to have a pool of resources with some degree of interchangeability and a way to communicate through different projects so as to be able to do a partial reallocation of the tasks. There’s a reason why projects almost never finish on time and regularly go over budget. The concept of “finite capacity” is not always well understood, and multitasking predominates. Intelligent Management, instead, uses a systemic algorithm for managing projects called ‘Critical Chain’. When an organization is synchronized, its ability to achieve its goals increases exponentially. A Systems Thinking approach determines how an organization functions in detail. In order to synchronize production and/or resources we must have a basic understanding of the consequences of managing systemically combined with the concept of the ‘constraint’ of the system.